There are dogs of all shapes, sizes, and colors at Orphans of the Storm®. Sometimes black dogs have to wait at the shelter a little longer than others, though–just because of the color of their fur! Let’s put an end to that by letting people know that black dogs are just as lovable and cuddle-able and companionable as every other dog. I met some great examples of that during my visit to Orphans of the Storm® this week. 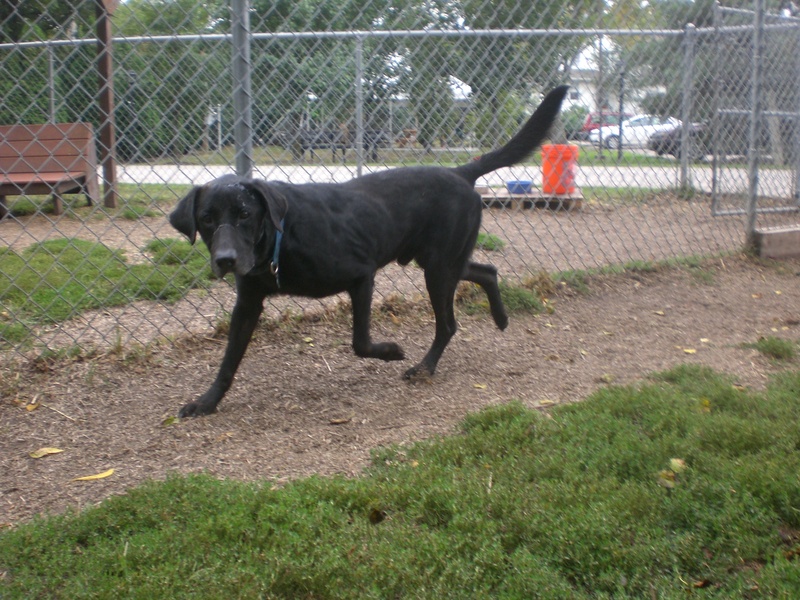 Brutus the eight-year-old black Labrador Retriever mix is just a happy-go-lucky guy. 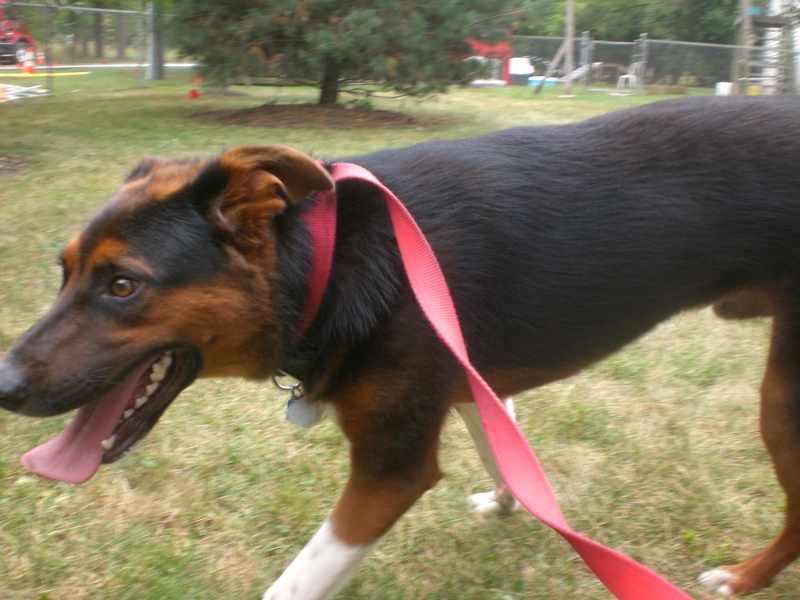 Not only does he have one of those doggy faces that makes it look like he’s smiling, but even his gait is happy! Take a look at that picture of him running towards the camera and try to tell me that he isn’t a happy pooch. And just think about how much happier he would be in a home of his own! Brutus may be eight, but he certainly doesn’t act like it. He was running and sniffing and wanting to play with the other dogs we saw while we were out on our walk. Brutus has very good manners, though, because when he realized that he couldn’t play with Gizmo he just sat right down by my feet and waited patiently. 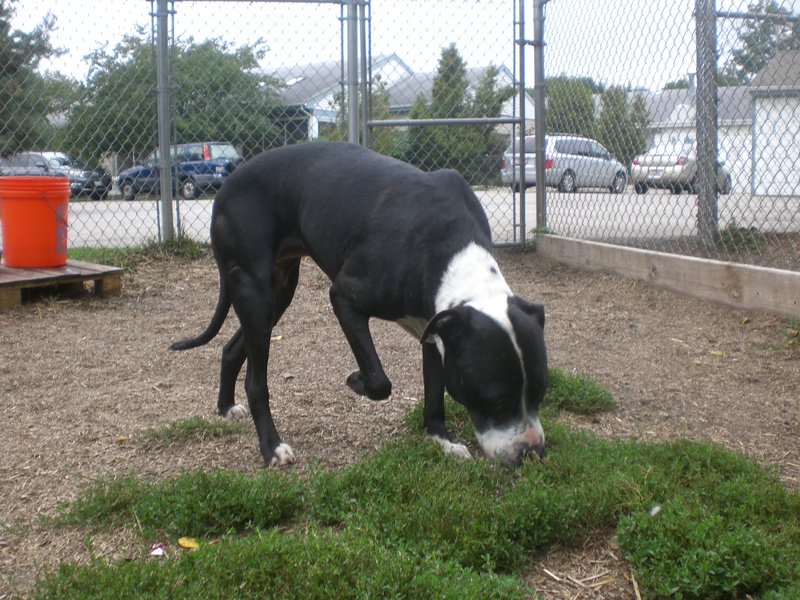 Any family would be lucky to welcome Brutus into their home. Brutus could be a model! China the five-month-old Pit Bull Terrier mix (not to be confused with China the Hound) came to Orphans of the Storm® with her sister a month or so ago, and her sister has since been adopted (her sister happened to have light brown fur). Who can resist an adorably wrinkly puppy face? Not me! An animal shelter (even one as nice as Orphans of the Storm®) is no place for a pup to grow up. Let’s find China a good home where she can learn how to be a great family member. 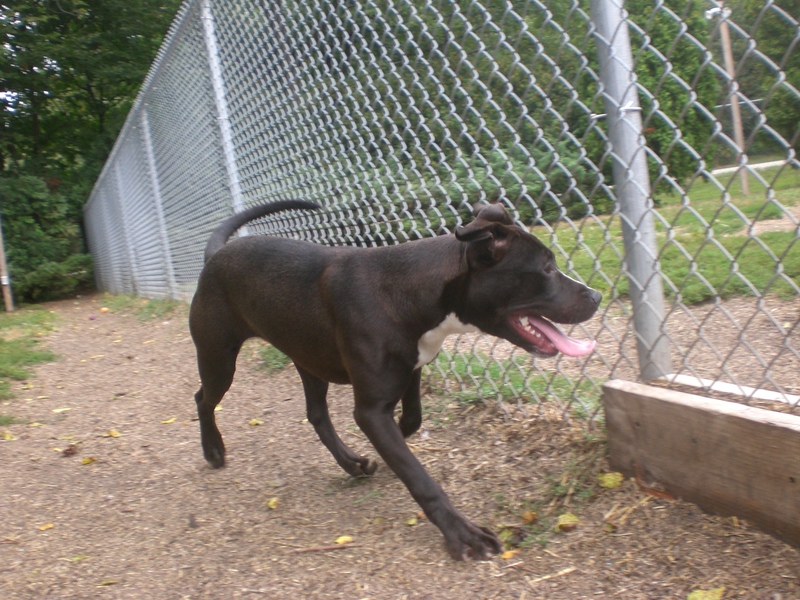 China is pretty lucky to have Midnight (another black dog) as a kennelmate, because Midnight is one of the sweetest dogs at the shelter and has been showing China how to be a good dog. China wanted to play with Midnight while we were out in the run and Midnight let her know when she was getting a little too rough. 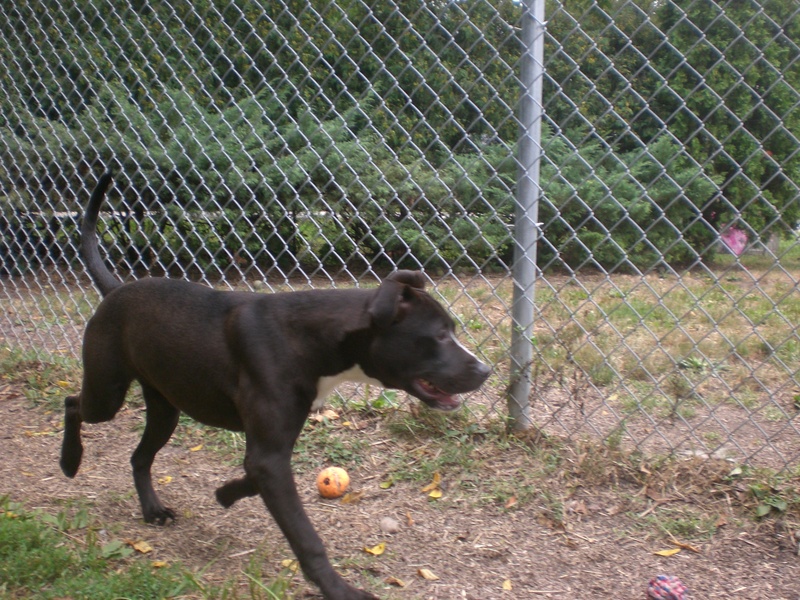 China loves to run and play and explore, and needs a home that will take the time to train and socialize her. She certainly has the makings to be a wonderful companion! Don’t let her call the shelter home for too much longer. 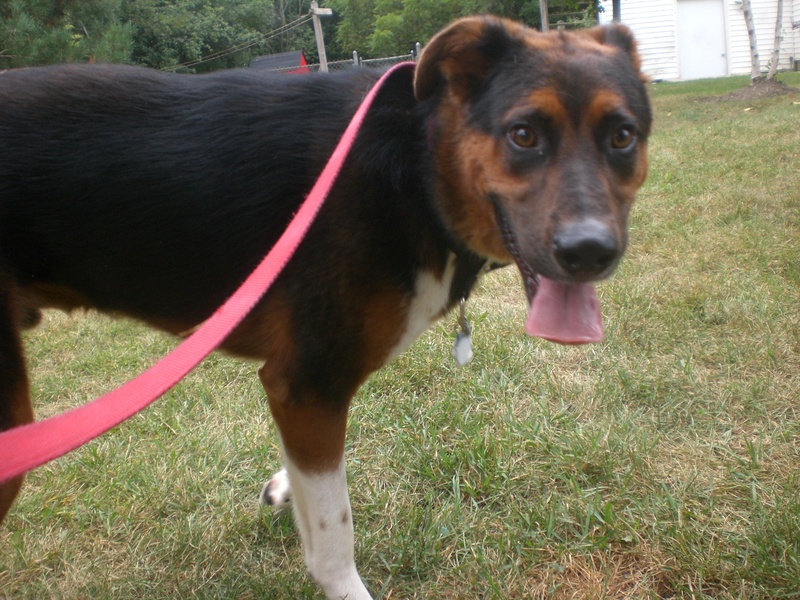 Tucker the one-year-old Shepherd mix is such a handsome guy, with his fluffy black, brown, and white fur and big brown eyes. He’s still practically a puppy, so he has plenty of puppy energy. He was leading the way on our walk and wanted to explore everything. Sometimes he just couldn’t decide which direction he wanted to go in! Tucker was friendly with everybody we met on our walk. One of the shelter staff came over to say hi to him, and Tucker immediately laid down and just loved getting the attention. 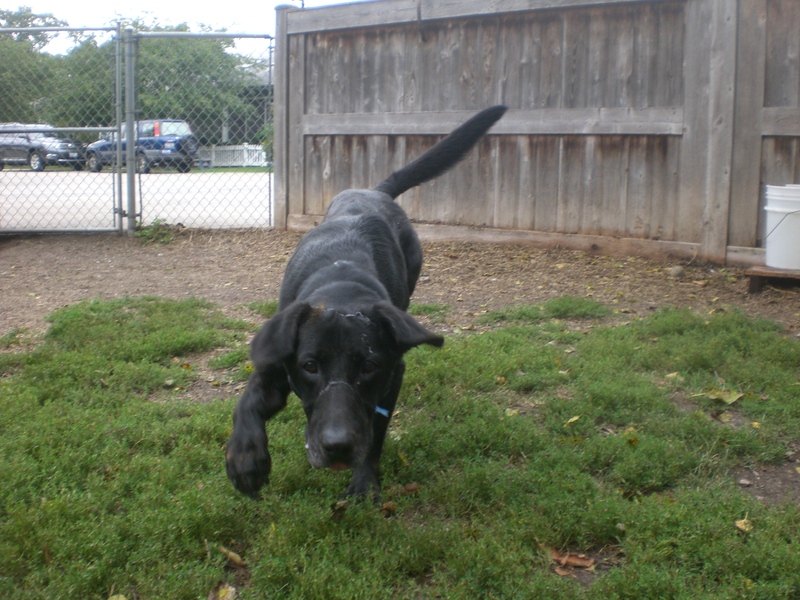 A dog as friendly and cute as Tucker won’t hang around the shelter for long, so if you think Tucker might be the pooch for you, come in soon to meet him! 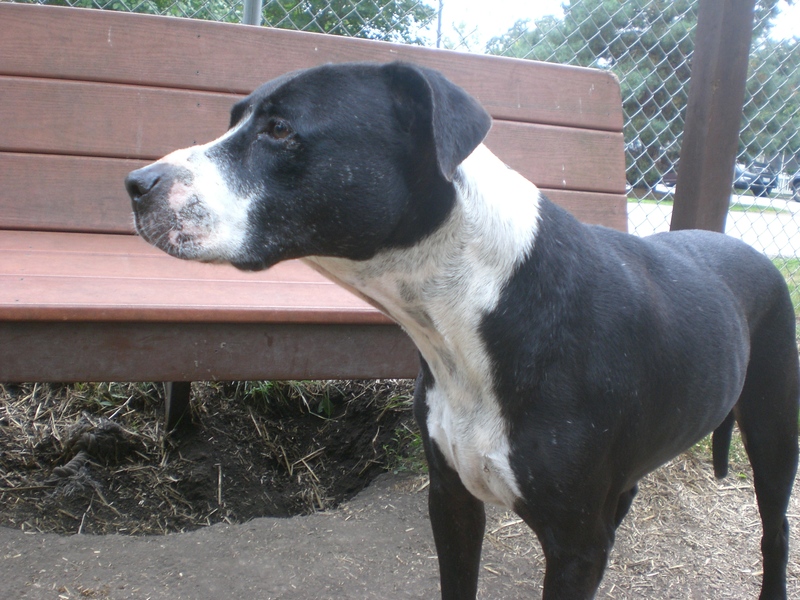 Daisy the six-year-old Pit Bull Terrier mix is a real sweetie. 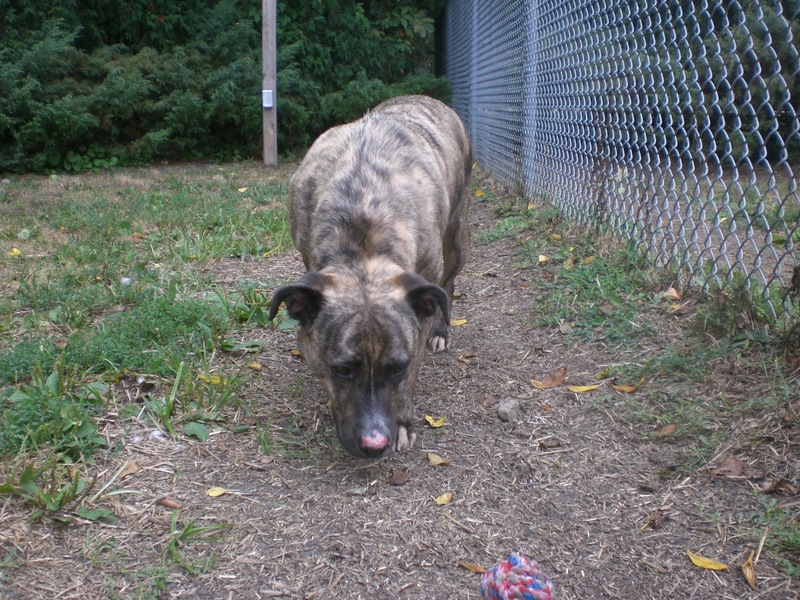 She’s pretty new to the shelter and so she’s still unsure of her surroundings, which makes her a little shy and nervous. Once she knows you, though, she gets attached quickly. She had only met Craig the day before, and she already wanted to follow him around! She’s sure to be a loyal companion. Daisy is an excellent leash walker who didn’t pull at all. Even when I took her off the leash when we were inside the run, she stayed close to my side. She came over to stand next to me while I sat on the bench and enjoyed getting a nice scratch on the back. Once Daisy learns that she can trust people, she will be such a loving pooch. Could you be the one who brings her out of her shell? Tiger the five-year-old Labrador Retriever mix isn’t a black dog, but I’m sure she would support the cause! (After all, she’s in Ella‘s old kennel.) 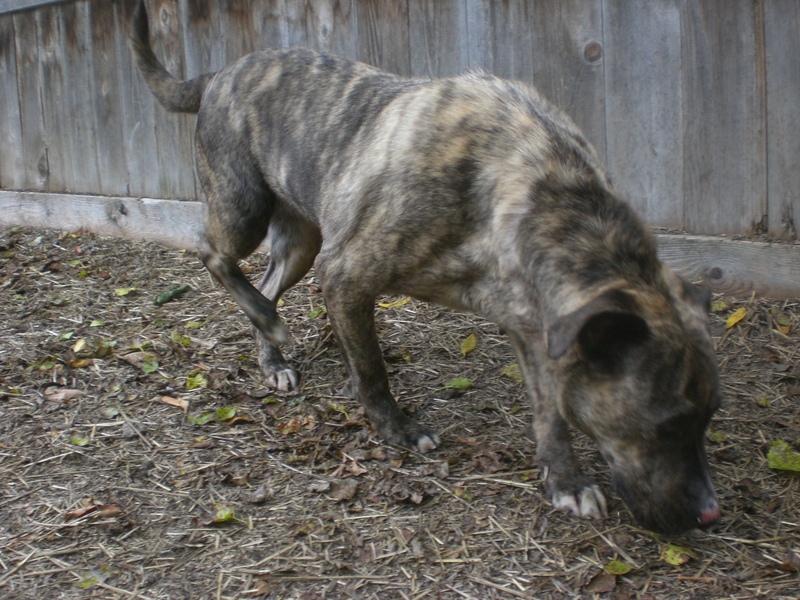 Tiger has the most appropriate name because her brindle fur has unique tiger-stripe markings. I knew I wanted to take Tiger out for a walk as soon as I met her, because she’s one of the dogs who will push against the door of her kennel in an attempt to get you to pet her, and then try to lick your fingers. So friendly! Tiger is equally friendly outside of her kennel. I took her to the off-leash run so she could stretch her legs, and once she had finished sniffing the perimeter she came back to me for a good scratch on the hips. She walked pretty well on the leash, which makes sense because she came from a home that unfortunately could no longer keep her. Since Tiger already has plenty of years of experience as a pet, all she needs is a new family to bring her home. I walked plenty of other old friends while I was at the shelter this week: Ebbie, Molly, Winter, Bailey, Frankie, Wilbur, Roscoe, Harley, and Tilly! Whew! Posted by Meet the Pooches on September 12, 2013 in Dog Profiles and tagged adopt, adoption, animal shelter, animals, Chicago, dogs, Labrador Retriever, Orphans of the Storm, pets, Pit Bull Terrier, Shepherd. I have never heard of a dog being discriminated against due to the color of it’s fur! My family has adopted 3 dogs from Orphans of the Storm and two of them have black fur…they are the best dogs ever!!! I knew there was some stigma with black cats, but I only learned just recently that it carries over to black dogs as well! Very silly. It’s wonderful to hear that your Orphans dogs are the best ever! Thanks very much for reading.